History of the Klamath River: One of California's last "free flowing" rivers! For many years before the first settlers the Klamath River was home to the Karok, Modoc, and Yurok Indian tribes. The Klamath was the life blood of the Native Americans who relied on it for its abundance of salmon and trout. The name "Klamath" was derived from an Indian word "Tlamatl" which means "swiftness" in Chinook. The Gold Rush of 1850-51 brought many miners and left a rich history. The miners caused a terrible disruption in the lives of the Native Americans of the area by damming and diverting water for mining purposes, which made it difficult for spawning salmon and other fish populations. There are remnants of old mining sites along the river. The town of Happy Camp was settled and named for its fruitful yields of gold.
" Only a few years ago the Upper Klamath was known only to a private river runner from Oregon, Jack Leroy. 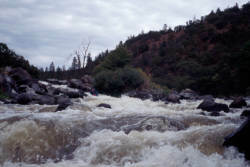 In 1979 Dean Monroe, head of Wilderness Adventures of Redding, floated the river and passed the word that the "Hell's Corner Run" was comparable to the Tuolumne. (Monroe invented the name "Hell's Corner," wrote a song about the river, and christened most of the rapids as well.) Within a couple of years, dozens of outfitters were applying for commercial permits." In the early 1980's, the town of Klamath Falls proposed to build the Salt Caves Dam. This dam would wipe out the "Hell's Corner section of the river. Years of heated debates began. In 1986 the Bureau of Land Management (BLM) was directed to study the Klamath River for possible induction into "The National Wild and Scenic River System." Finally in 1994, the 11 miles of canyon from the J.C. Boyle Powerhouse to the Oregon-California state line were designated a federal Wild and Scenic River. This designation provides federal and state protection to the outstanding values of the river and its canyon. The Klamath is one of California's last "free flowing" rivers!